For post-1980 demonstrators, see Modern Demonstrators. 13660: Mabie Todd Blackbird demonstrator: transparent twist-button filler, 12.7 cm long, gold plated trim, as supplied to dealers without nib or feed. Filling mechanism is internally identical to a button-filler, but is actuated by turning the filling knob clockwise to empty the sac. Typical age roughness to clip plating, rust spots to pressure bar. 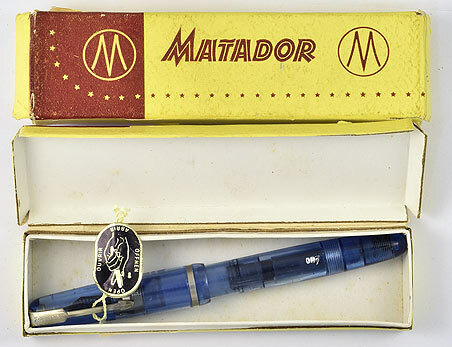 13887: Matador Click 007 demonstrator in box: transparent blue piston-filler, 13 cm long, nickel plated trim, gold plated nib, new old stock with clip tag, some internal stress marks visible from original manufacture, two available. 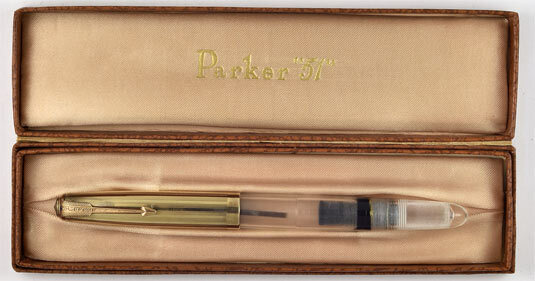 13513: Parker 51 demonstrator: rare first-year black double-jewel with clear hood, red collector, barrel marked "DEMONSTRATOR", metal Speedline filler, aluminum jewels, imprint on blind cap with 2nd quarter date code, smooth sterling silver cap with imprint at top, long clutch. Cap is clean, though with wear to the geometric decorative band, small patch of stress marks at end of barrel over filler where overtightened in the past (see detail; only apparent under magnification). 13908: Parker 51 demonstrator: transparent Lucite Vac-filler, Lustraloy cap, chrome plated trim, clean barrel imprint with 4th quarter date code. These pens were not sold to the public, made for a brief period in 1947-48 for dealers, salesmen, and repairmen only. 13889: Waterman Ink-Vue demonstrator: dealer's version in transparent celluloid, not sold to the public, 13 cm long, chrome plated trim, usual darkening to the barrel, keyhole-vent nib. 8923: Waterman Ink-Vue demonstrator: dealer's version in transparent celluloid, not sold to the public, 13 cm long, chrome plated trim, Tip-Fill feed; usual darkening to the barrel, a very clean example of a particularly uncommon, fully functional demonstrator. Fresh to the market -- came to us with a slightly later #5 needlepoint nib, Oregon store's name on barrel.